Professor Emeritus, John Weeks, at the School of Oriental & African Studies, University of London on the BRICS nations intention to create their own bank. "They say it’s going to be nothing like the World Bank. But don’t bank on it. Much better than a project bank for the ‘South’ would be an institution providing long-term loans in foreign currencies." For many years, various officials of governments in Africa, Asia and Latin America have urged the creation of a ‘development’ bank that they would control. On Tuesday 15 July, those hopes become a reality in Forteleza, Brazil, with the formal creation of the New Development Bank by the leaders of the so-called BRICS group of countries (Brazil, Russia, India, China and South Africa). This event raises several political questions for progressives: what type of ‘bank’ do the BRICS leaders propose; why is it needed; are these the appropriate leaders to organise and control the new institution; and is it something progressives should view favourably? The BRICS proposal has two parts, a ‘development’ bank and a US$ 100 billion reserve of international currencies.The former has similarities to the operations of the World Bank, while the latter would have some functional kinship with the International Monetary Fund. At this point, the plans for the second – short-term support for balance of payments problems – remain a work in process. Those for the first are quite clearly specified. A little tedious background is necessary. An international ‘development’ bank is a non-profit, cross-country, public sector institution that makes loans to governments for long-term projects, either directly productive ones (e.g., a hydro-electric dam) or supportive of productive activities (e.g., roads and highways). A development bank’s sine qua non lies in offering loans at more favourable terms than private banks. The Bretton Woods Conference of 1944 created the World Bank to provide loans of this type. In addition, Africa, Asia and Latin America each has a regional development bank (the African Development Bank, the Asian Development Bank, and the Inter-American Development Bank). Why is another one needed? The answer is simply stated – global power and its changing distribution over the last 50 years. The proposals for the IMF and the World Bank at the end of the Second World War assigned voting power in accordance with the contribution of each member government to the capital base of the institution. In contrast, each country would have had one vote in the International Trade Organisation (ITO), proposed at the Havana Conference of 1947-1948 to regulate world trade. The Open Democracy reader will not be surprised to learn that opposition from the US Government resulted in the early death of the ITO. In practice, the IMF and World Bank voting shares conformed to the demand of the US Government to have control of both institutions. The governments of the countries that emerged as the victors in the Second World War held the overwhelming majority of votes in both the IMF and the World Bank, with the US Government grabbing the largest share. The institutional power held by the United States, Great Britain, France and Canada became increasingly disproportionate to their economic power as the Federal Republic of Germany (‘West Germany’) and Japan emerged as major economic actors (and this anomaly would be even greater in the UN Security Council, with no permanent seat for either). Bitter complaints about this imbalance resulted in marginal adjustments to voting shares among the developed countries, but still left peanuts for the economically blossoming BRICS. It is this complaint by the BRICS governments about the lack of power that prompts the new bank. They want a financial institution in which they hold the controlling shares. Closely related to this aspect of institutional power is the long-standing opposition – even outrage – among governments in the developing world at the policy conditions attached to IMF and World Bank loans (grants for the latter). In the World Bank, the use of these well-known and notoriously anti-development conditions substantially increased with the institution’s shift from ‘project lending’ – most of it for infrastructure – to ‘budget support.’ In the 1970s, almost all World Bank lending went to projects. In the 1980s came the Latin American debt crisis, and with it a massive shift in the World Bank to loans made directly to governments, with their use not specified. For example, in place of a requirement that US$ 200 million to Zambia be used to build a hydro-electric damn, conditions would require the government to privatize public enterprises, savagely cut government employment, and drastically slash public spending. The implicit, and frequently explicit, purpose of these conditions was to convert the recipient governments to extreme neo-liberal economic policies. Brazil (in the 1980s) and Russia (in the 1990s) especially suffered from this ideologically driven ‘structural adjustment’. All the regional development banks joined in the neo-liberal conditionality game with varying degrees of enthusiasm. In summary, the BRICS bank would provide a less ideological source of lending for infrastructure, and in so doing shift some power in global governance away from the governments of the G7 countries. It would appear that any government in the developing world could qualify to join and apply to borrow. However, it is a bit geographically challenging to describe it as the development bank of the ‘South,’ given that Russia is one of the founding members; the largest founding member is entirely north of the Tropic of Cancer except for a tiny sliver (China); and a third was entirely north of the Equator the last time I checked a world map (India). Setting aside pedantries about location; is this Gang of Five likely to shift international lending in a more humane and flexible direction as Oxfam hopes? We should note that the voting proposal for the BRICS bank follows the IMF/World Bank model – money votes with shares, reflecting each government’s financial contribution. The largest voting share goes to China, whose record on investments in Africa is nothing short of appalling (see my discussion of Chinese capital in Zambia). 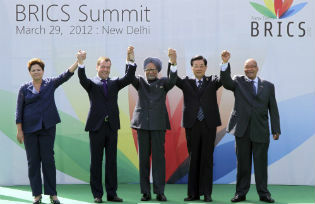 How should progressives react to the BRICS bank? Many predict or at least hope that the new lending institution will improve the access of middle and low-income countries to financing for infrastructure. This is likely to be realised because World Bank project loans not only carry neo-liberal conditions, the procedures to obtain them are extremely bureaucratic. If the BRICS bank can operate less bureaucratically than the World Bank, that would be a substantial gain in itself. However, it is worth asking what to me is the obvious question – why is it necessary for countries to borrow to build, for example a new airport? The problem is never ‘money.’ Any government of a country that has its own currency can borrow from the central bank (this would not apply to the 14 members of the West and Central African currency zones). Only one reason comes to mind about borrowing from abroad: that the project may require substantial imports of materials. Thus, the purpose of the borrowing is to obtain US dollars, yen, renminbi, etc. Since the purpose of the loan is to obtain foreign currency, the process by which the BRICS bank reviews and assesses specific projects will likely involve the same unnecessary bureaucracy that we find in the World Bank. The suspicion uppermost in my mind is that the purpose of the BRICS bank, as a project funding bank, is to link the finance offered, to the construction firms and materials suppliers located in the BRICS themselves. Certainly, the Chinese Government is notorious for doing this (see ‘China insists on “tied aid” in Africa’). Much better than a project bank for the ‘South’ would be an institution providing long-term loans in foreign currencies. This would have several major advantages over the BRICS bank as envisaged. First, the loans could be made on the basis of a judgment about the ability of the government to repay, not a narrow assessment of a specific project. This rather difficult judgment is the de facto basis of all loan repayment – can the country’s export sectors generate the foreign exchange to service the debt? Second, the borrowing country’s external debt would increase by the foreign currency component of the project; the rest would be financed domestically. This arrangement would be in line with the famous advice of John Maynard Keynes in 1933, ‘let goods be homespun whenever it is reasonably and conveniently possible, and, above all, let finance be primarily national’ (emphasis added). John Weeks is Professor Emeritus, School of Oriental & African Studies, University of London, and author of ‘Economics of the 1%: How mainstream economics serves the rich, obscures reality and distorts policy’, Anthem Press, published earlier this year.